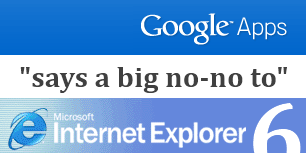 We got an email today morning from the Google Apps Teams stating that the team will be phasing out support for Microsoft Internet Explorer 6.0 (IE6) on Google Apps over the course of 2010. IE6 currently has discontinued support even from it's own manufacturers. The discontinuation of support of these older browsers on the Google Docs suite and the Google Sites editor will start on March 1, 2010 followed by Google Mail and Google Calendar, after which some of the critical and basic features of Google Apps will not work properly in the browser (IE6). Not only IE6, any versions of Google Chrome below version 4 won't be supported too. Google will start displaying a message to users in Google Docs and the Google Sites editor on these older browsers explaining this change and asking them to upgrade their browser users. Google Apps will have support for these browsers: Internet Explorer 7.0 and above, Firefox 3.0 and above, Google Chrome 4.0 and above, and Safari 3.0 and above.